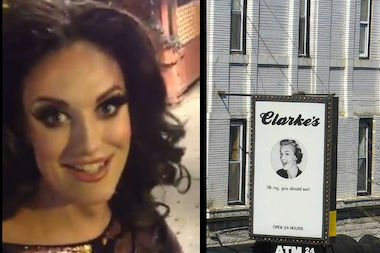 Drag performer Sara Andrews shot a video of her friends being turned away from Clarke's in Lakeview over the weekend. CHICAGO — A 24-hour diner that has been a staple of Lakeview's late night scene for years is under fire after a group of LGBT performers said they were denied entry because of the way they were dressed. Nick George, general manager of Clarke's Diner, 930 W. Belmont Ave., said the restaurant decided to hire security after a spate of robberies and other crimes near the Belmont Red Line station. Though there is an actual police officer on duty, the diner has another person who can turn away people at the door if he feels they will disrupt other customers. That person is basically there to make sure people aren't "fighting, overly intoxicated, loud and swearing" in the restaurant, George said. But some members of the city's drag community say the security guard is policing wardrobe decisions more than bad behavior. Early Saturday, a video surfaced on Facebook featuring drag performer Sara Andrews, who says she and her friends were turned away by a Clarke's security guard because they were gay. Andrews, who lives in Florida but regularly performs at the Kit Kat Lounge & Supper Club in Chicago, said she and her friends headed to Clarke's after midnight on Saturday to eat. When a security guard turned them away, she was shocked. "'You're just messing with us, right?' I had to have asked him that at least 10 times," Andrews said. "He just stood there not replying." As the video picked up steam on Facebook, some of Andrews' Chicago friends reached out to her with stories of their own — and vowed to boycott the diner. Artist Jojo Baby said he and drag performer Sissy Spastik were turned away after a Lollapalooza party performance last month. He had on a mask, and was told he could not come inside while wearing it. "I never had trouble with them before ... I've walked in there with scarier stuff on," Jojo said. "That's why it was shocking. They're in a gay neighborhood ... you have to keep an open mind." George said the security guard has been placed on leave while they sort the whole thing out, but insisted the guard was not targeting anyone because of their race, gender identity or sexual orientation. "Discrimination is not our policy in any way, shape or form," George said. "If it wasn't for gay people, we wouldn't be open." George added that figuring out who might cause trouble on a chaotic street full of drunk people in the middle of the night is a tough job, and that the guard turned away Andrews and her friends after he saw them in a "verbal altercation" near Berlin, 954 W. Belmont Ave.
Andrews acknowledged that a group of "hooligans" shouted at her before she headed to Clarke's, but said she would never get into a fight outside of a club. "As if I would 'fight' anyone in general with all this silicone in my face," she said. Entertainer RaShaan Houston said he's been going to Clarke's for 11 years, but when a friend in drag was turned away for wearing shorts that were "too short" earlier this summer, he decided he was done. "Nobody was fighting, nobody was being loud. It was a 'dress code issue,'" Houston said. "I wasn't aware that Clarke's has a dress code. I work real hard for my money. If you don't want it, I'll take it somewhere else." Houston said Clarke's owes his friends an apology, and if they do want to institute a dress code, they should be up front about it — not turn away people at the door. "It's humiliating," he said. "It's not a nightclub with a velvet rope. It's a restaurant." George said the restaurant plans to issue a statement soon, and had a meeting with employees to discuss this weekend's incident Tuesday afternoon. But Sissy Spastik says she won't be going back. "At the end of the night, all we wanted to do was eat and go home," she said. "We weren't expecting to get told at the door of a diner that we can't come in."